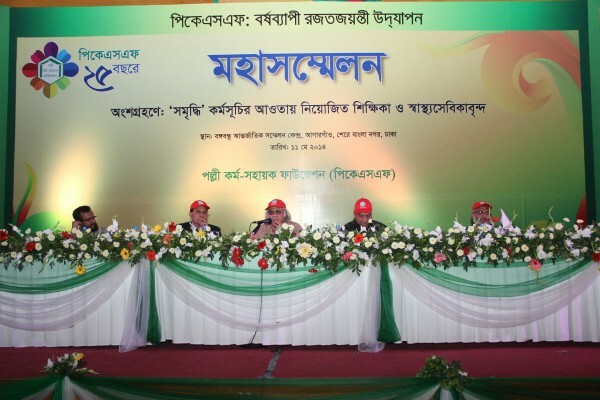 On the occasion of the inaugural ceremony of PKSF’s Silver Jubillee on 11th May, 2014, at the Bangabandhu International Conference Center, ENRICH held a conference for the hundreds of health volunteers and teachers of its health and education programmes. Dr. Qazi Kholiquzzaman Ahmad, Chairman, PKSF, chaired the event and Mr. Md. Abdul Karim, Managing Director, PKSF delivered the opening and closing words. Hosting the event was Dr. Jashim Uddin, Deputy Managing Director (Administration and Finance), PKSF. Also present were PKSF’s Mr. Md. Fazlul Kader, Deputy Managing Director (Operations-1), Mr. Golam Touhid, Deputy Managing Director (Operations-2), members of PKSF’s staff and over 2000 ENRICH programme volunteers. Dr. Qazi Kholiquzzaman Ahmad, founder of the ENRICH Programme, welcomed the health volunteers and teachers. He said that the goal of ENRICH was to ensure and protect the human dignity of every individual from birth. This is not simply a matter of financial means, but more importantly a matter of every individual’s rights. He believes that the nation should become a community working together towards its sustainable development, where all men stand shoulder to shoulder. Together, Dr. Ahmad believes, Bangladesh will alleviate illiteracy, illness and disease, malnutrition and all other aspects of poverty. 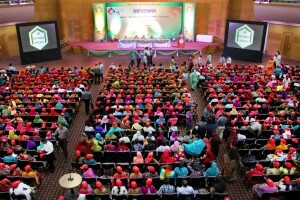 The conference called on the health volunteers and teachers to discuss their experiences in the field, the effects of the programme on the target people, existing problems faced by the volunteers and possible solutions, and the future development of the ENRICH programme to better serve the poor in a sustainable manner. The conference provided a platform upon which these service providers could be acknowledged and allowed them to share their thoughts.